You say on the beach. On the seafront (the seafront is the area of land next to the sea). You can also say waterfront. On the river: The boat is on the river. The log is floating on the river. Paris is built on the river Seine. So why do you sometimes hear IN the Sea? Now you can also hear people saying in the sea or in the river. What’s that then? In the sea is different from on the sea. In the sea means in the water, which actually means under the water, or at least partly underwater. When you’re swimming, you’re in the water. That’s why you say you’re swimming in the sea (or in the river or in the pool). Fish swim in the water. 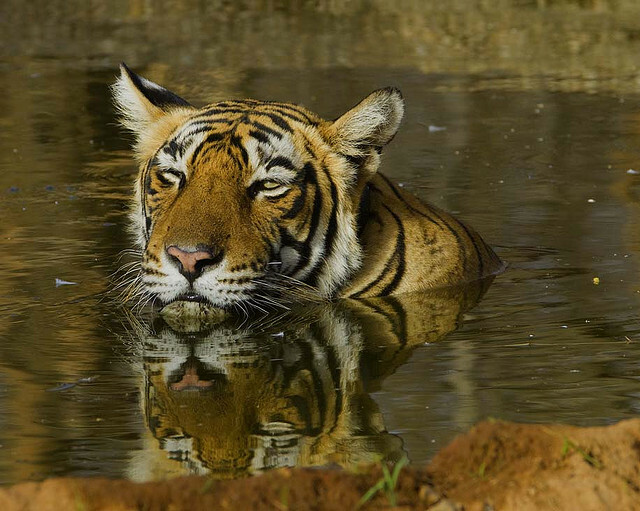 The tiger in the picture is in the water. But ships sail on the water, because you see most of the ship above water. A large part of a ship is actually in the water, but we don’t see that. So boats, ships, rafts, inflatable beds and surfboards etc. are on the water. And when ducks are in the pond, they are swimming in the water. Even if like with boats we actually see most of the duck above water. Choose a preposition (on or in). You do this quiz online here. 1 The buoy is floating ____________ the water. 2 The most expensive houses are _____________ the seafront. 3 London is _______________ the River Thames. 4 We explored Alaska ______________ a cruise ship. 5 There are some amazing koi fish swimming __________ the pond in front of their house. 6 They were making a fire ___________ the beach. 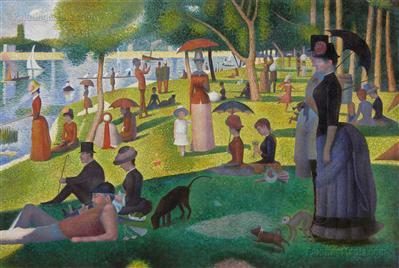 7 The famous painting “A Sunday Afternoon on the Island of La Grande Jatte” shows people relaxing ___________ the banks of a sunny lake. 8 When we were on our safari, we saw hippos ___________ the water. Only their eyes were visible. 9 It’s fun to float your rubber boat _____________ on the lake. 10 The sea is rough. The swimmers are fighting not to drown _______________ the waves. Would it be correct to say swans paddle in the lake? Or swans paddle on the lake? Thanks. Nice question. Both sound good to me.